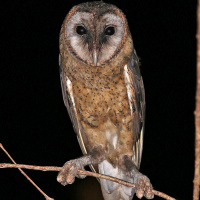 The Taliabu Masked Owl is a medium-sized owl with no ear-tufts. It is Also known as the Sula Island Masked Owl. Very little is known about this rare species. Description: The facial disc is pale reddish-brown, becoming darker towards the eyes. The rim is similar in colour. The eyes are blackish-brown, and the bill blackish-grey. Upperparts are dark brown, with whitish speckles from the crown to the lower back and on the wing coverts. Primaries are uniform brown with whitish tips. The tail is brown with three darker bars. Underparts are deep golden-brown with dark spots, with some of the spots having pale areas. Legs are feathered reddish-brown to the lower third of the tarsi. The toes and the bare parts of the tarsi are grey. The claws are blackish. Size: One specimen - Length 31cm. Wing length 283mm. Tail length 125mm. Weight unknown. 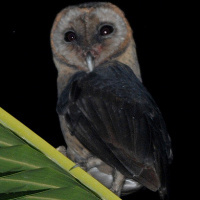 Habits: The Habits of the Taliabu Masked Owl are unknown. Voice: A hissing sound typical of barn owls. Hunting & Food: Unknown, probably similar to other barn owls. Habitat: One specimen was found in a lowland forest. More recent sightings have been in heavily logged forest and dense secondary bamboo thickets. It apparently occurs within a broad elevational range. 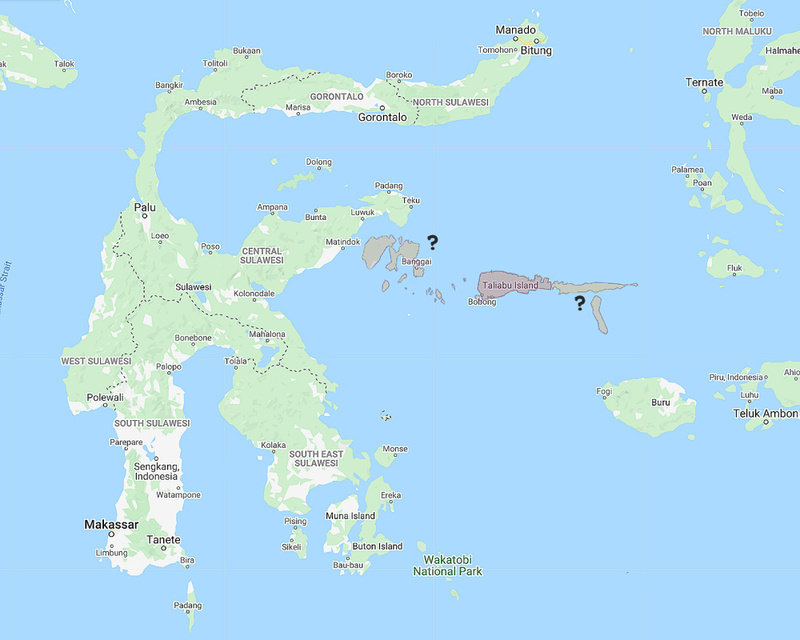 Distribution: Taliabu Island in the Sula Archipelago in the Moluccan Sea. Status: Extremely rare, listed as Vulnerable by Birdlife International. Original Description: Neumann, Oscar Rudolph. 1939. Bulletin of the British Ornithologists' Club (BBOC) 59: p 89-90. Mikkola, Heimo. 2012. "Owls of the World: A Photographic Guide". Bloomsbury. Rheindt, F. E.. 2010. "New biogeographic records for the avifauna of Taliabu (Sula Islands, Indonesia), with preliminary documentation of two previously undiscovered taxa". Bulletin of the British Ornithologists' Club 130(1): 33-51. See also: Other owls from Asia, Genus: Tyto. Page by Deane Lewis. Last updated 2016-02-18.